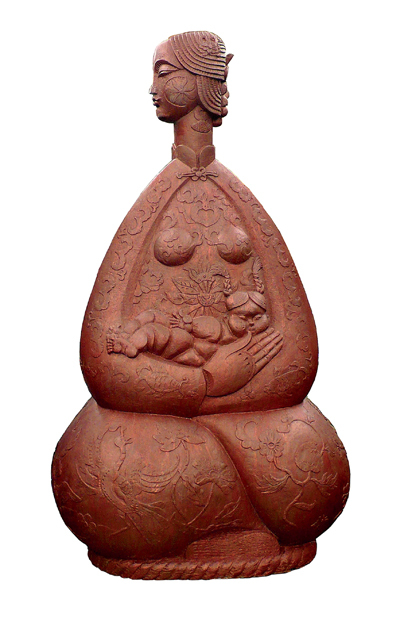 "This artwork applies the techniques of expression from the traditional sculptures and folk art. It has a simple form with the combination of structure and lines, embodying the fluent thought, being alive in both externality and internality, emphasizing the features and innovations of folk art and depicting elegance with an ordinary form. This sculpture presents a young mother and her beloved infant, whose facial expression is elegant, sweet and kind. Their clothes are decorated with auspicious Chinese folk patterns to achieve a glamorous effect. This sculpture conveys the nature of female pursuing beauty and the love for beautiful life and also expresses the strong willing of human to live with nature harmoniously together."